On June 21, 1945, Second Lieutenant Fukujirō Nagashima took off from Miyakonojō East Airfield as a member of the 26th Shinbu Special Attack Squadron and died in a special (suicide) attack west of Okinawa at the age of 23. He piloted an Army Hayate Type 4 Fighter (Allied code name of Frank). After his death in a special attack, he received a promotion to Captain. He was from Tochigi Prefecture, attended Tochigi Teachers College, and was a member of the 1st Class of the Army Special Cadet Officer Pilot Training (Tokubetsu Sōjū Minarai Shikan) Program. The 26th Shinbu Special Attack Squadron was formed at Akeno Air Base in Mie Prefecture on February 14, 1945. Nagashima wrote down his thoughts below in May 1945. – I believe that Japan is as eternal as heaven and earth. – I believe in certain victory in the decisive battle at Okinawa (Greater East Asia War). – I believe that special attack squadrons will continue one after another. Born as a warrior in a divine country, today I am at the place with most honor. I believe in the eternity of Shinshū . I will make a sortie to the place of the decisive battle, and I expect certainly to sink a warship. I am the embodiment of the Army Special Attack Corps. Nagashima wrote the following final letter with four death poems. The last one is a haiku (17-syllable poem with 5-7-5 syllable pattern), and the next to the last one is a tanka (31-syllable poem with a syllable pattern of 5-7-5-7-7). Day by day I am in very high spirits. I am waiting for the sortie with each moment seeming like an eternity. Five unit members have already died for an eternal cause. Some day we will meet at Yasukuni . A young cherry blossom who is 23 years old goes to fall in a raging storm during the country's crisis. Our Seii  Squadron will make a sortie to Okinawa where is the decisive battle. Kobayashi and Kaizu already made taiatari (body-crashing) attacks. Our comrades have gone, and we who remain could know what was in their hearts. At OO  Kikuchi , today also O planes will make a sortie. Okinawa is the place where Yamato  men will fall. I also certainly will do it. There is still a large aircraft carrier. That name of my plane Hayate also is strong . The writings and poems come from Terai (1977, 103-4). 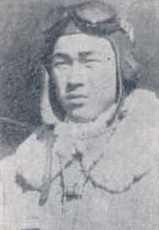 The biographical information in the first paragraph comes from Chiran Tokkō Irei Kenshō Kai (2005, 164), Osuo (2005, 196), and Terai (1977, 102). 1. Shinshū refers to Japan and literally means "divine land." 2. Yasukuni Shrine in Tōkyō is the place of enshrinement for spirits of Japan's war dead. 3. The name Seii means "warring against barbarians." This was another name for the 26th Shinbu Squadron. 4. OO and O indicate information that was a military secret and could not be included in the letter. 5. This refers to Kikuchi Airfield in Kumamoto Prefecture. 6. Yamato is an ancient name for Japan. 7. Hayate means strong wind in Japanese.